The Phillies haven't always been a pleasure to watch, but they have a strategy that's working. The 2018 Phillies are simultaneously both better, and more boring than many people expected. Through about one quarter of the season, the Phils are in a very tight race for first in the NL East that seems to have a new top dog every single day. They are 13-5 at home and boast an early Cy Young candidate in 5-1 Aaron Nola. And offensively they bring it too, with Odubel Herrera's .346 batting average (through Wednesday afternoon) near the top in all of baseball. The youthful core is coming together and the team is learning how to win. But, boy, can they be a drag. On the surface, Philly's .325 on base percentage alludes to a good offense, and that's more or less accurate. But not necessarily how you'd think. The Phillies have drawn the third most walks in MLB this season with 146 (only the Nationals and Yankees have more). They are really, really patient. Through 35 games, no team has faced more pitches per plate appearance than Philadelphia. The interesting thing about the Phillies' at-bats from afar is that they see a ton of pitches, but they also swing a lot. The Phillies have the third most swinging strikeouts in baseball, yet the fewest strikeouts looking by a wide margin. They also let the first pitch go by more than 76 percent of the time, the second highest rate of taking first pitches in the league. One could argue that's a good thing. The Phillies are somehow maintaining the ability to be aggressive while also make opposing pitchers work – and it's benefitted them. They swing at 44.5 percent of pitches — which is the seventh best rate in baseball, only behind contenders like the Dodgers, Astros, Diamondbacks, Yankees and outlying Marlins. “One of the hazards of seeing a lot of pitches and going deep into counts is you’re going to strikeout some,” Kapler added. If not for a debacle late in the game, the Phillies patience almost helped them gut out what would have been their biggest win of the season last week. Philly pushed Washington's Max Scherzer — another Cy Young front-runner — to 111 pitches two outs into the seventh inning before he was lifted from the game. Though they were able to get a lead, briefly for starter Jake Arrieta, the bullpen couldn't seal the deal in Sunday's 5-4 walk-off loss to the Nats. 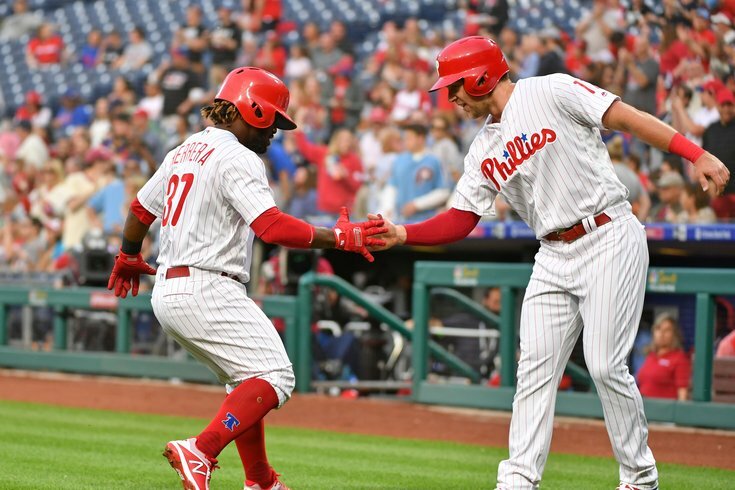 The abundance of young talent — like Herrera, Rhys Hoskins, Jorge Alfaro, Maikel Franco and others and the ability they have shown to sit and wait at the plate bodes well as the team matures and forms itself into a contender. There has never really been a correlation proven between more pitches seen and a potent offense, but the benefits do exist and getting through a starting pitcher quickly DOES usually correlate to victories. It's a new style of baseball for fans of the 2008 World Championship squad, a team known for mashing home runs and playing at a fierce pace that included more than a few Jimmy Rollins first-pitch pop ups. Under Kapler's microscope of managerial style, the Phillies are the darlings of the sabermetric era and playing live sports based on advanced analytics isn't the stuff of sell outs and parades — yet. But the wins keep coming and the Phillies have proven to be legitimate contenders for a playoff spot. Which means the slow, deliberate and "new school" brand of baseball being played at Citizens Bank Park isn't going anywhere for a while.